1-Ali, W.Kh. ; Abdul-Rassoul,M.S. and Ali,H.A.,(2011):Taxonomic study of the Tribe: Agrilini Laporte , 1835 (Coleoptera: Buprestidae) in Kurdistan-Iraq. First Scientific Conference of Biology Department. College of Science. Kirkuk Univ.20-21 April 2011. 2-Ali, W.Kh. ; Abdul-Rassoul,M.S. and Ali,H.A., (2011):Taxonomic study of the Tribe Acmaeoderini Kerr., 1893 (Coleoptera: Buprestidae) in Kurdistan-Iraq .The 5th Scientific Conference of College of Agriculture, Tikrit Univ. 26-27 April 2011. 3-Ali, W.Kh. ; Abdul-Rassoul,M.S. and Ali,H.A.,(2011): New record of Dicerca aenea(L.),1766 (Buprestidae:Chrysochroinae) in Kurdistan –Iraq. Second Scientific Conference for Biological Science, College of Science, Mosul Univ. 16-17 November, 2011. 6.Hamodi, A.A-F. and Abdul-Rassoul, M.S.,( 2010): Four new species of Thrips (Thysanoptera, Thripidae) from middle of Iraq. Bull. Iraq nat. Hist. Mus. 11(1):. 7-Mawlood, N.A. and Abdul-Rassoul M.S.,( 2006) :A new species of Rhyncomya Rob-desvoidy,1830. (Diptera, Calliphoridae) from Iraq. Bull. Iraq nat. Hist. Mus. 11(3): (in press). 10-Swall .M.A;Abdul-Rassoul M.S and Ali.A.H. ,(2009): Key to species Adalia mulsant (Coleoptera : Coccinellidae ) in Iraq .Journal of Wassit for Science and medicine ,2(1):12-16. 14- Ali, H. H. and Abd Ali, B. A., (2009): Study the Biodiversity of Iraq, Status , Threatens and Conservation . Alustath ,Vol. 91: 273 –297. 15- Mohammed, M. K, Abd Ali, B. A. and Ali , H. H., (2010): Some aspects of biodiversity change in Lake Razaza as a result of water shortage. Alustath ,Vol .132: 469-482. 16- Al-Kinani, A. I., Abd Ali, B. A. and Ali, H. H., (2010): Growth evaluation and suitability of some tree species used in the project of holy Najaf shelter belt .Alustath, Vol. 137:199_216. 18-Al-Zubaidi, A. A.,( 2006): Mineralogical Study and Origin of Clay stones of Injana Formation ( Upper Miocene ) – Southern Hamreen – Central Iraq. 8th International Conference on the Geology of the Arab World ( GAW ). Cairo University. Cairo. 19-Al-Zubaidi, A. A., (2007): Paleoenvironment of some Vertebrate Animals ( Upper Miocene – Pliocene ) – Central Iraq. 2nd International Conference on the Geology of the Tethys, Cairo University. Cairo. PP. 49. 20- Al-Zubaidi, A. A., (2008): Arid Land Ecosystem of Gaara Depression – Iraqi Western Desert. 2nd International Environmental Forum. Tanta University. Tanta. PP. 30. 21-Al-Zubaidi, A. A., (2008): Mineralogical Study and Origin of Clay stones of Injana Formation ( Upper Miocene ) from Bashiqa and Butma near Mosul – North Iraq. 4th International Conference on the Geology of the Tethys . Cairo University. Cairo. PP. 28. 22-Al-Zubaidi, A. A., (2009): Geochemistry of Mudstones of Injana Formation ( Late Miocene ) from Bashiqa and Butma anticlines near Mosul – North Iraq. Egyptian 2nd International Conference in Chemistry: Chemistry for Human Needs. Hurghada. 23-Al-Zubaidi, A. A., (2009): Vertebrate Fossils and Sedimentology of Late Miocene Site – Central Iraq. Annual International Conference of Natural Protectorates Pioneers Society. Sharm Al- Sheikh. 24-Al-Zubaidi, A. A., (2010): Origin of Silica Minerals in the Geodes of the Iraqi Iraqi Western Desert. 5th International Conference on the Geology of the Tethys . Cairo University. Cairo. 25-Mohammed, M. K. and Al-Zubaidi, A. A., (2008): The Natural Reserves and Ecotourism in Iraq, Alustath Jour. N. 78, PP. 581- 602. 26-Al- Zubaidi, A. A., (2009): Geochemistry of Mudstones of Injana Formation (Late Miocene) From Southern Himreen- Central Iraq. Proceeding of 3rd Scientific Conference of the College of Science. PP. 1858- 1865. 27- Al- Zubaidi, A. A., (2010): Water Resources and its Environmental Importance at Gaara Depression – Iraqi Western Desert. Jour. Al- Mustansiriya Science , Vol. 6, PP. 276-284. 28- Al – Moussawi , A . A., ( 2008): First record in Iraq of two nematode parasites from the blue-cheeked Bee-eater Merops Superciliosus Persicus Pallas, 1773. Bulletin of the Iraq Natural History Museum , 10 (3): 1-7. 29- Mohammad K. M. , Al-Moussawi A. A., Jasim S. Y., (2010): Helminth Parasites of the Green Toad Bufo viridis Laurenti, 1768 in Baghdad area, Central Iraq. Egyptian Academic Journal of biological Sciences , , 2 (1) : 17-25. 30- Al – Moussawi , A . A. , (2010): First record of Tanqua anomala (Linstow, 1904) from the dice snake, Natrix tessellata tessellata (Laurenti, 1768) in Iraq. Bulletin of the Iraq Natural History Museum , 11(1) : 27-38 . 31- Mohammad, M. K. , Al-Moussawi, A. A ., ( 2011) : Record of Paryphostomum testitrifolium Gogate, 1934 (Trematoda) and Paradilepis scolecina (Rudolphi, 1819) (Cestoda) from the Cormorant Phalacrocorax carbo (Linnaeus, 1758) in Baghdad area . Proceedings of the 4th international scientific Conference of Salahaddin University-Erbil, vol.2 : 574-578. 32- Mohammad M. K., Al-Moussawi A. A, ( 2011): Prevalence and infection rate of three gizzard Nematodes in the Mallard Anas Platyrhynchos L.,1758 collected in Al-Diwaniya and Diyala Provinces , Central Iraq .Ibn AL-Haitham Journal . 2011 , vol.24 ( 3) : 15-24. 33- Al-Moussawi A. A and Mohammad M. K., ( 2011): Contracaecum rudolphii Hartwich, 1964 (Nematoda: Anisakidae) in the Cormorant Phalacrocorax carbo (Linnaeus, 1758) wintering in Baghdad area : a new host record in Iraq. Bull. 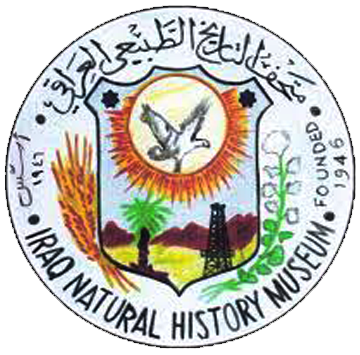 Iraq Natural History Museum, vol. 11 ( 3 ) :7- 16 . 41-Abdul_Rassoul , M.S. ;Augul , R.S. & AL_Saffar, H.H.,( 2009) :Seasonal Abundance of Adult Beetles species the Exposed “Carcasses” in Baghdad city .Ibn AL_Haitham J. For pure and Appl. SCI.Vol.23(1) 2010 :16 – 25 . 43- Abdul_Rassoul , M.S. ;Ali ,H.B. & Augul , R.S., (2011):Study A new host for plain tiger butterfly Danaus chrysippus Linnaeus (Lepdoptera: Nymphalidae , Danainae) in Baghdad province. J. Education of the Collage of Basic.Vol.18(76):63-66. 45- Abdul_Rassoul , M.S. ;Augul , R.S. & AL_Saffar, H.H.,(2009): Seasonal abundance of third instar larvae of fllies (Order: Diptera) on the exposed carcasses.J.of the Iraq Natural History Museum.Vol.10(4):1_10. 51- Shaker, G.A., (2008): Stem rot and leaf spot of Eucalyptus sp and its control AL-ANBAR JOURNAL OF AGRICULTURAL SCIENCES. 6 ,(1) 310-315. 52- Shaker, G.A. ,(2008):DIAGNOSIS OF FUNGI CAUSING ROOT ROT AND DEATH OF FICUS TREES. Mesopotamia Journal of Agriculture. 36 ,(4) 223-227. 53- Shaker, G.A. ,(2008):Causal agents of Gerbera seedling death and there integrated control. BASRAH JOURNAL OF AGRICULTURAL SCIENCE. 21 (2) . 54- Shaker, G.A. ,(2010):Identification Of Gray Mold on Gerbera jamesonii plants. IBN AL-HAITHAM JOURNAL FOR PURE AND APLLIED SCIENCE. 23 (1) 92-97. 55- Shaker, G.A. ,(2010):IDENTIFICATION OF PATHOGENIC FUNGI ASSOCIATED WITH WATER HYACINTH IN SELECTED REGIONS IN THE MIDDLE AND SOUTH OF IRAQ. Bulletin of the Iraq Natural History Museum. 11 (2) 61-68. 56- Shaker, G.A. ,(2011):ISOLATION AND IDENTIFICATION OF PATHOGEN OF DAMPING OFF Antirrhinum majus SEEDLING AND IT IS INTEGRATED CONTROL. 8th Scientific Conference for Agricultural Researches. 16 , (3 ). 57-Shaker, G.A. ,(2010): Electrophoretic pattern of two Alternaria spp. proteins as a species identification. Scientific symposium no.11 veterinarian sciences between heritage and today. Center of revival of Arabian science heritage ,18 october . 1 (11). 256-261. 58- Shaker, G.A. ,(2012): Identification of Pestalotia planimi the fungal causes leaf spot on Gerbera jamesonii Al-Nahrain University Journal For Science .15 (3). 59- Raed Raouf Al-Ani, Shaker, G.A,(2013): Induction of Systemic Acquired Resistance against Alternaria solani which caused early blight on tomato. Arab Journal of Plant Protection.31(1).